UBI Research estimates that the global AMOLED production capacity will grow at a CAGR of 48% from 2018 to 2020. Overall production size will grow from 13 million square meters in 2017 to 40 million square meters in 2020. 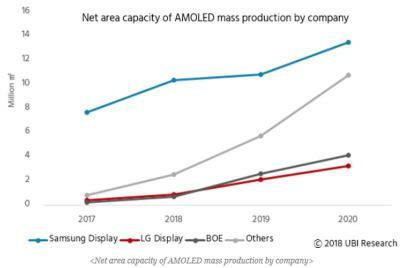 Small and medium-sized displays will continue to lead the AMOLED market, with 32 million square meters in 2020 (compared to 8.4 million in 2020). Samsung Display will continue to dominate but its market share will drop to around 45% in 2020 (down from around 90% in 2017).